We’d love your help. Let us know what’s wrong with this preview of A Stranger Is Watching by Mary Higgins Clark. Ronald Thompson knows he is not guilty of the murder for which he is about to be executed. There are only two days left to unmask the real villain - a terrifying psychopath who has killed before and has unfinished business with his victim's family. To ask other readers questions about A Stranger Is Watching, please sign up. A Stranger is Watching is a very simple story, but the killer here is not given God like status. He needs to work hard so as to avoid being brought in by the New York police. Eventually bad luck, plus some hard work on behalf of those people on the angels' side, literally catch up with him. I think that the author will never kill a main character, unless the latter has died in the past, viewed via flashbacks. It's kind of understandable, it makes sense. The blow of death is softened, because the A Stranger is Watching is a very simple story, but the killer here is not given God like status. He needs to work hard so as to avoid being brought in by the New York police. Eventually bad luck, plus some hard work on behalf of those people on the angels' side, literally catch up with him. I think that the author will never kill a main character, unless the latter has died in the past, viewed via flashbacks. It's kind of understandable, it makes sense. The blow of death is softened, because the death happened to someone who isn't as known by the readers as the living characters in the present. Formulaic though the structure of the book is, it's a winning formula. Mary Higgins Clark must have exhausted every permutation throughout her career before her readers said enough was enough. Before, i.e, fatigue set in. The author experienced a lofty position, and I'm glad that she is not as forgotten as say, Harold Robbins. أجاثا تفتعل الجريمة وتختم بكشف المجرم، أما ماري فتخبرك بالجريمة وتعرفك على القاتل من أولى الصفحات، فلا تمل من التكملة لمعرفة كامل الحكاية. رون، شاب متهور وبدأ في العودة لاتزانه، جريمة افتعلها بغير وعي جعلته المشتبه الوحيد في قتل نينا، يراقب القاتل الحقيقي محا خليفة أجاثا كريستي؟؟.. بل أشد، تملك موهبة رائعة، أجاثا رواياتها رتيبة، قليلة الشخصيات، إلا من إثنتين أو ثلاث كمحور الأحداث، أما مارك كلارك فتنتقل من مشهد إلى آخر كأحداث فيلم سينمائي مثير، لا تُنهي مشهد دون أن يحتوي على الإثارة في آخر سطوره. يختطف القاتل الحقيقي، ابن نينا وحبيبة ستيف.. الصحفية شارون، وتبدأ دوامة الشكوك، الحيرة، قلة الحيلة، القلق، والذعر، طفل يعاني الربو، تداهمه الكوابيس عن مشهد قتل والدته الذي رأه بأم عينه، مع رجل مختل عقليًا، يتخذ القتل هواية، واسم "الثعلب" لقبًا لمكره ودهاءه الشديدين. When I first read this, I started and then forgot to stop. What it lacks in some qualities it makes up for with the fact that there is no right place to take a break and put it down. I started it one school night and had to stay up until three to finish it. Don't tell my parents. Mon premier Mary Higgins Clark et sûrement aussi mon premier policier. Je me souviens ne pas avoir réussi à le lâcher tant que j'avais pas lu le dernier mot. Une grande écrivaine à suspense! I chose to read the book "A Stranger Is Watching" by Mary Higgins Clark. This book follows the story of a man named Steve as well as his son Neil and Steve's girlfriend Sharon. One day when Sharon is watching Neil alone, a mysterious man only calling himself "Foxy" kidnaps them both. From then on, the story follows individual characters ranging from Steve to Sharon and even Foxy himself as Steve tries to save his girlfriend and his son. We are given several viewpoints of the situation through th I chose to read the book "A Stranger Is Watching" by Mary Higgins Clark. This book follows the story of a man named Steve as well as his son Neil and Steve's girlfriend Sharon. One day when Sharon is watching Neil alone, a mysterious man only calling himself "Foxy" kidnaps them both. From then on, the story follows individual characters ranging from Steve to Sharon and even Foxy himself as Steve tries to save his girlfriend and his son. We are given several viewpoints of the situation through the eyes of multiple characters, so it is interesting to see how they act and react to certain scenarios. This is a suspense thriller that keeps you on the edge of your seat waiting to see what happens next. What I think is most interesting about this book is the way it gives more than one viewpoint to the situation. You get to see just what is going on inside the head of the kidnapper as well as the lives of those he's changed. There is more than just the kidnapping as well. There is also a sort of murder mystery at hand that, at the beginning of the book may seem to already be solved, but it begins to change as you uncover just what was actually happening all along. The book for the most part succeeds in being suspenseful, however the ending is very abrupt compared to the rest of the book and only serves it's job to end the book. Luckily the book has intriguing characters that keep the book going even in the slower portions. Some of these characters you really begin to sympathize with. Especially Sharon and Neil, who undergo torturous conditions under a very psychotic villain. This is a good book for anyone who likes suspense or who likes murder mystery's. Mary Higgins Clark pretty much never disappoints. I was actually surprised to find that this was originally published in 1977. It was only when I found myself asking why the characters were using payphones rather than cell phones that I looked up the publication date. A good, fast-paced mystery. I picked it up off my shelves of books I pick up at thrift stores for $0.25-$0.50 while trying to decide what to read next, knowing it would only take me a day or two to finish. 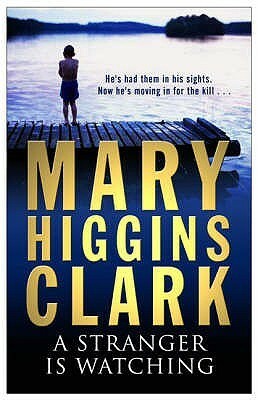 It was an engrossing stor Mary Higgins Clark pretty much never disappoints. I was actually surprised to find that this was originally published in 1977. It was only when I found myself asking why the characters were using payphones rather than cell phones that I looked up the publication date. A good, fast-paced mystery. I picked it up off my shelves of books I pick up at thrift stores for $0.25-$0.50 while trying to decide what to read next, knowing it would only take me a day or two to finish. It was an engrossing story that kept me on the edge of my seat. المرة الأولى التي أقرأ فيها رواية للكاتبة الأمريكية ماري هيجنز كلارك ..
اعتدت على كتابات أجاثا كريستي البوليسية وهي البارعة في هذا المجال ..
الرواية لم تعجبني كثيرا ..
فنحن نقفز بين " اللقطات " أقصد الأحداث ..
وهي طريقة صعبة المجاراة ..
المهم انها تتحدث عن قضية إعدام شاب ..
ليتبين عبر الرواية انه بريء ..
مع وجود قاتل متسلسل وقنبلة وقضية اختطاف . قصة اعتيادية في الكثير من الأفلام الأمريكية . Het boek speelt het zich af in een tijd, dat er nog geen mobieltjes zijn. Maar dat doet niets af aan het verhaal. Het leest heerlijk weg. De spanning blijft er voortdurend in. This review has been hidden because it contains spoilers. To view it, click here. I thought it was pretty good and a bit predictable but Clark doesn't give much background on the bad guy. You must accept that great hatred exists for his victims and proceed from there. Several near misses and coincidences move the predictable plot ( as i said before) along as well. There was some suspense in the tale. However, Clark's cookie-cutter writing formula all but guaranteed her trademark ending. A handful of sympathy cards are played as Clark weaves this tale. You're kinda required to I thought it was pretty good and a bit predictable but Clark doesn't give much background on the bad guy. You must accept that great hatred exists for his victims and proceed from there. Several near misses and coincidences move the predictable plot ( as i said before) along as well. There was some suspense in the tale. However, Clark's cookie-cutter writing formula all but guaranteed her trademark ending. A handful of sympathy cards are played as Clark weaves this tale. You're kinda required to feel sorry for asthma ridden Neil and dull Sharon as they endure their horrid confinement. At the same time we're supposed to believe good Ronald Thompson would be put to death so swiftly for a crime he committed when he was 17. Everyone who has any influence in the justice system turns a deaf ear down to the wire. It has to be that way so or Clark's story won't work. I have to admit that this is the first book I have ever read a book by this famous author. I love mysteries so I don't know how I have missed such a classic writer. I am only reading it because it was left in a holiday apartment I am renting. I could not put this book down. It is fast paced, you feel empathy for all the characters as Clark, brings them all to life with their tales from the past and heart wrenching stories. I could visualise Grand Central Station, from the graphic details. Clark is now on my radar and I look forward to reading more of her books. This book was quite good. Alexandra's 3 year old son was kidnapped two years ago which ended in the destruction of her marriage because her husband blamed her for the kidnapping because of the young babysitter she hired. This book has a lot of twists and turns and some good mystery and a surprising ending. I enjoyed it. Hee, hee, it was fun seeing the pricing in this book from 1977. The sentence said, "he had paid $140 (at which point I'm thinking, Wow, only $140 a night for a hotel in NYC) for THREE nights at the Biltmore Hotel across from Grand Central Station." Other than prices giving away the book's year of publication this was classic Mary Higgins Clark suspense. Ok, that's a great book, alright. But I "only" give 4 stars because of the stereotypes in this book: to quote only 1 of them: in Grand Central Station,the description. The women run to go home to prepare dinner and are anxious to be late, and the business men going home earlier because of (something). I'm sorry but morally I can't give 5 stars, don't resent me. My all-time favorite of her books. Excelente, la pluma de esta escritora es magnifica, una trama con suspenso hasta el final. El tema de la pena de muerte deja mucho que pensar. Just like every book I read of this majestic author, It was literally unputdownable. Steve Peterson's wife Nina was murdered 2 years ago and his son Neil witnessed it. Based on Neil's testimony and the testimony of a neighbor across the street, Ronald Thompson was convicted of the murder and sentenced to death. Sharon Martin is a journalist strictly against the death penalty and trying to petition to keep Ronald Thompson from being electrocuted. Steve and Nina met while debating the death penalty and are dating despite being on opposite sides of the debate. While staying with Neil one night, Sharon and Neil are kidnapped by a man calling himself Foxy and are held for ransom at Grand Central Station. As Steve, the FBI, neighbors, etc. all race the clock to rescue them, it is revealed that "Foxy" is actually A. R. Taggert and he is the person who actually killed Nina. He was an auto mechanic who would search the roads for broken down cars with alone female drivers and murder them. He then progressed to using a CB radio to find his victims. Nina had broken down shortly before her murder and Arty was the one who "helped" her. Last Saturday, while I was dusting my bookshelf, I just realized I have some bunch of new books I haven't read yet. I know I want to read some good ol' MHClark book so I just blindly picked what book to read, and it's A Stranger is Watching! This story started with the culprit's POV, as usual, no name dropping and that's when the guessing game started. What I always love about MHC's stories is that we got to act like a real detective and gather all the information so we could guess who's the bad Last Saturday, while I was dusting my bookshelf, I just realized I have some bunch of new books I haven't read yet. I know I want to read some good ol' MHClark book so I just blindly picked what book to read, and it's A Stranger is Watching! This story started with the culprit's POV, as usual, no name dropping and that's when the guessing game started. What I always love about MHC's stories is that we got to act like a real detective and gather all the information so we could guess who's the bad guy is, and this story didn't disappoint at all. The story revolves around Steve Peterson. Two and a half years ago, his wife was brutally murdered, the source of death was suffocation. She was suffocated to death using her own scarf. The crime scene was witnessed by their then three-year old son Neil. The perpetrator, or what they believed, was now being held under police care and is up for a death penalty after two days. Steve is now romantically involved to Sharon Martin, a journalist who's openly against the death penalty. Then that same day after the interview they went together, Sharon and Neil were kidnapped, and that's how the chasing begins. As usual, the story is quite different to her other stories before. I love the idea actually, I love that this story also tackles about the death penalty which has been starting to make noise here in the Philippines. Honestly, when I haven't read this story, I am pro-death penalty. I know it's only God's prerogative to judge and sentence someone to death, but I've been hearing heinous crimes in the news ALWAYS and most of the victims were kids. But now, I'm not sure anymore. I don't want to talk more about that because it's going to be a very long explanation hehe. I'm sorry but I will be dropping a slight spoiler in a few minutes. Unlike her other stories, this one, it's hard to guess who's the real culprit because it's obvious he/she or they were not close to the victim. It took me quite a long time but finally I was able to guess the real bad guy. It turns out that he's not just a random killer slash kidnapper but he's some sort of a psychopath. He adores women, especially if they're good looking, but when they hinted that they don't like him back, he just flipped and killed them in an instant. He is also known as recording his victims and taking their pictures after killing them. The story were not made in a very fast pace giving us a room to gather all the proofs aiding us to know who's the bad guy, thus making us pretty occupied and never lost our interest. The characters were fine with me. Usually, MHC introduces so many characters in her books, but this time, it's not that many at all so it was pretty easy to keep track of them. But guessing the culprit was quite a task because unfortunately, it was only in the middle or I guess almost a few chapters until it's ending that his real name was introduced. For the main characters, I love how two opposite personalities were able to fall in love. It's been pretty clear in the first chapter that Steve and Sharon share different views about death penalty and Sharon is starting to end their relationship because they don't agree in most things. Plus, his son, Neil doesn't like her. But I was glad to find out how little by little, Neil was starting to like her considering their circumstances. I guess that's the best thing about the kidnapping thing lol. Also, in this story, the heroine was a damsel in distress, she's so helpless unlike MHC's other stories that I've read before. I don't usually fall in love with MHC's heroes, and for this one, nothing has changed. The culprit was surprisingly convincing and is really lewd at the same time. I can't comment any further than that hah. The characters were fine and they were able to do their roles well. Aside from the positive characters, there were also some opposing ones which makes this story quite realistic because that's life. Whether we like it or not, there are really some people who oppose us and some who will point us to a wrong direction. The final few chapters were death defying and so thrilling that it was really hard for me to put it down. It was quite a happy ending with only 1 character end up being dead. Not totally what I have in mind but still was a good way to end this story. As usual, this story is very reader friendly which is what I always love about MHC. The writing style is impeccable and the story, the twists and turns were quite clever especially how she makes all the characters connected to each other. The idea and the twist and turns are great but surprisingly, I didn't find this one promising. I guess it's because of my mood or maybe because of my impending headache but I find this story just in between. Don't get me wrong, I love the thrill but I think I'm still looking for something, something that I don't know lol, if you know what I mean. So for this story, I'm giving it a 3.5 star rating. Not so much a whodunit as a will they find them in time. The kidnapper/killer is introduced early on, not by name, but we honestly have no hope of learning who it is until late in the story. There's a good undercurrent story here of a woman struggling to win over her new boyfriend's son. The little boy lost his mother a few years earlier, and as such has closed off from the world. It's touching how they attempt to bond and survive. Lally, the woman who lives in the train station, is unnecessary to Not so much a whodunit as a will they find them in time. Lally, the woman who lives in the train station, is unnecessary to me. She honestly brings nothing to the story, she does nothing to help or hinder anyone. I don't fully understand why she is there, other than to add pages. I've read there is a movie to this book, I may watch it in the future. Overall, a good thrill ride, I really enjoyed most of this. The deaf guy, Clark needs to bring him back. I thoroughly loved how he could tell so much from a simple recording. This is a story I wasn't sure I would enjoy. Usually anything short of almost 400 pages isn't nearly developed enough for my tastes. I quickly learned that this was not the case. Ms. Clark can quickly and what is seemingly effortlessly spin a tale that captures your attention and holds it throughout. I was in awe of her ability to tell the story from each individual character's viewpoint, and do not regret picking up this short read. Steve Peterson lost his wife to a brutal murder, and Ronald Tho This is a story I wasn't sure I would enjoy. Usually anything short of almost 400 pages isn't nearly developed enough for my tastes. I quickly learned that this was not the case. Ms. Clark can quickly and what is seemingly effortlessly spin a tale that captures your attention and holds it throughout. I was in awe of her ability to tell the story from each individual character's viewpoint, and do not regret picking up this short read. Plot is MHC signature: different characters and slowly building up the story till everything comes together for the ending. Steve is a widower with a son. His wife was killed at home which the son witnessed and where an innocent young man was jailed and about to be executed for the murder. Fast forward to two years when the execution is about to happen, Sharon, the one he has his eye on had been kidnapped along with Neil, his son. The events leading to the end of the story are all fast and a bit Plot is MHC signature: different characters and slowly building up the story till everything comes together for the ending. I really enjoyed this plot. Loved how it focused in detail on one central plot and really dove into the characters development. Written in the 1970s I don't know if that helped with the depth of writing, it felt fully plotted and not rushed like most books nowadays. I didn't go into this book with any expectation and so I was pleasently surprised. A good thriller with interessting characters. Although, I have to say, there is only so much, that you can do on such few pages. So no imense charcter building or shooking plott-twists can be expected. But if you like you're average thriller, this is one of the good ones.